Organised jointly by the European Committee for Homeopathy, the International Association for Veterinary Homeopathy and the Association of Homeopathic Physicians in Bulgaria, it was the first symposium to bring together practitioners and students from across these disciplines and provided a great opportunity to talk with homeopaths and others from across Europe with an interest in promoting this great system of healthcare. The event opened with a classical music concert and speeches from Hélène Renoux, ECH President, and Edward De Beukelaer, homeopathic veterinary specialist. It also included a moving tribute to the greatly missed Peter Fisher. Next, Dora Pachova, education sub-committee co-ordinator and driving force behind the conference, explained the strategies being  used to integrate homeopathy into medical practice in Bulgaria. 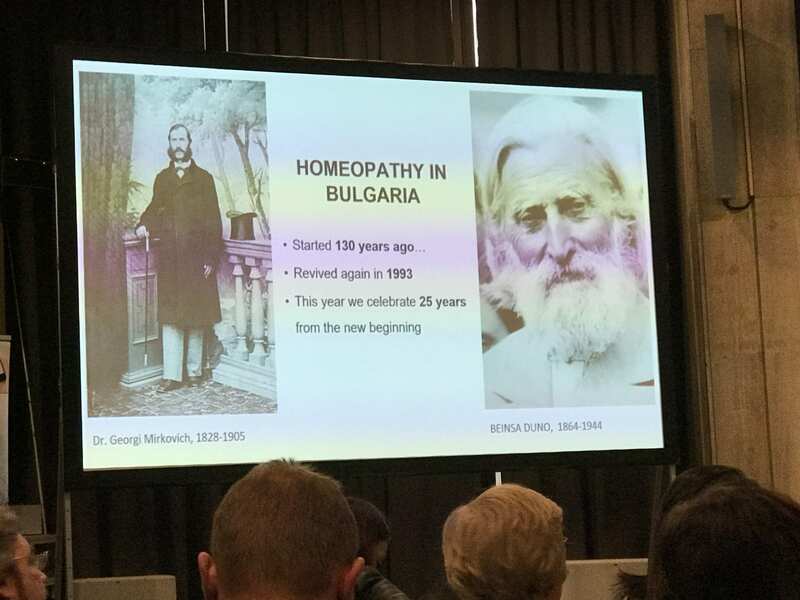 She explained how homeopathy had first come to Bulgaria, had declined in the early 20th century (in parallel with much of Europe and the US) but had seen a revival in the 1990s. There are now more than 3,000 doctors practising integrated medicine, in Bulgaria, around 2,000 of whom have specialist knowledge of homeopathy. Dr Geetha Krishnan Gopalakrishna Pillai, technical officer of AYUSH, the Indian ministry which incorporates homeopathy, explained the work that he and others in India had been doing to further collaborations with the World Health Organization (WHO) in the promotion of traditional and complementary medicine as a global practice. The doctor’s message was one of optimism, and he stressed the potential of homeopathy to alleviate global health crises, including antibiotic resistance. Over the weekend we were treated to a wide range of homeopathic gems, from wound healing in horses to cutting-edge research on patients with cancer. Franziska Bläuer, Barbara Bichsel and Katharina Gaertner provided cases and a synopsis of homeopathy under the Swiss public health system; Sigrid Kruse described the use homeopathy in babies suffering from opioid and heroin withdrawal in a Munich university children’s hospital; and Susanne Diez spoke about her collaborative work with her cardiologist husband in her daily homeopathic practice in Austria. On the final afternoon, Sara Eames presented us with the story of the Royal London Hospital for Integrated Medicine. Her descriptions of the great healing that had happened there and the denials of any ‘evidence’ over the years, reminded us that homeopathy has, again and again, been faced with challenges and a need to adapt to different circumstances and times. I left Sofia with snow falling on the hills and a positive sense of the benefits of interdisciplinary cooperation. I am convinced that our homeopathic community must continue to work with those who share similar ideals for a healthier, happier humanity. Alison Fixsen is the Society's Research Officer. Next, Dora Pachova, education sub-committee co-ordinator and driving force behind the conference, explained the strategies being used to integrate homeopathy into medical practice in Bulgaria. Dr Geetha Krishnan Gopalakrishna Pillai, technical officer of AYUSH, the Indian ministry which incorporates homeopathy, explained the work that he and others in India had been doing to further collaborations with the World Health Organization (WHO) in the promotion of traditional and complementary medicine as a global practice. Alison Fixsen is the Society’s Research Officer.